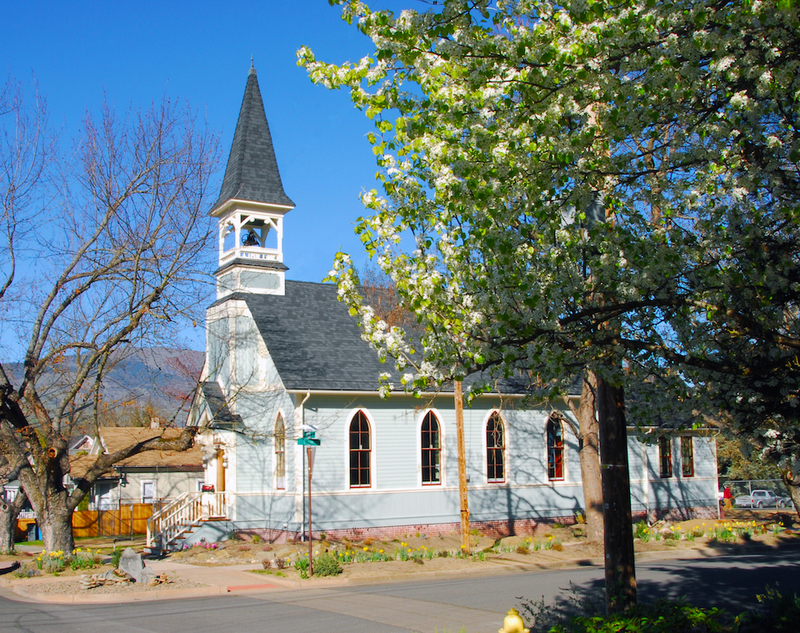 While strolling along the leafy streets of Ashland’s Historic Railroad District, Cory Ross noticed the for-sale sign on a Pentecostal church, a 125-year-old Gothic Revival charmer. The venerable building, with its cracked steps and disheveled steeple, looked orphaned and desperately in need of some TLC. “Somebody should do something,” Ross thought. 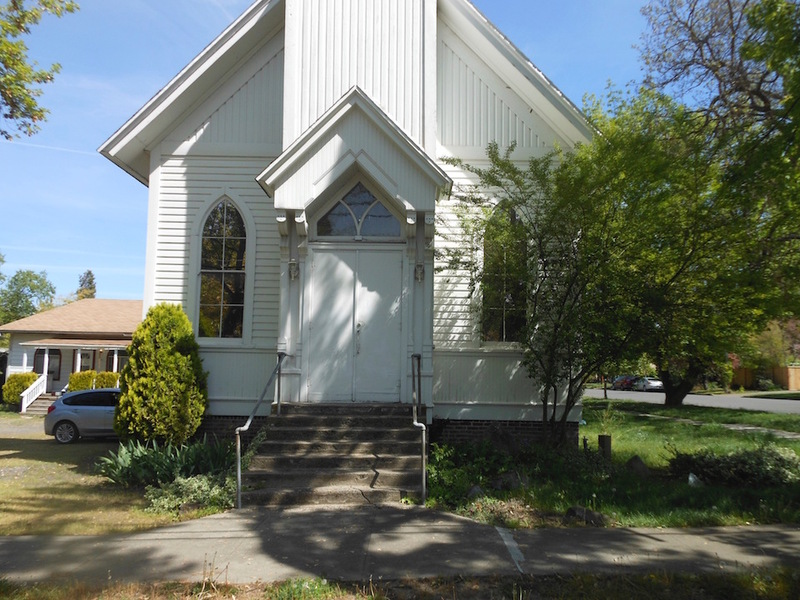 The exterior of the 15-year-old Pentecostal church, before renovation. Ross and Greg Conaway had recently married and moved into a house in Ashland to begin their new life. Both retired, they had plenty of time to travel, meet friends, hike in the mountains and enjoy Ashland’s cultural treats. The walls were bowed, the grand windows were blocked, and there were piles of bat guano in the bell tower. Conaway had admired the church in passing for years. “It was really quaint, like it had been plopped down out of Vermont,” he said. They loved it. 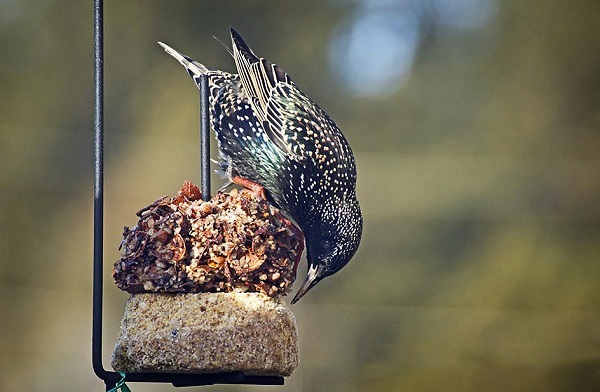 On a wing and a prayer, they made an offer, even though they weren’t quite sure what they’d do with the structure. It came as a bit of a surprise when their offer was accepted. One thing was certain-they had no intention of converting it into a residence. “We thought maybe we could make it into some kind of community center or business venture,” Conaway said. They invited friends and a few neighbors into the church for a charrette. Everyone sat in the old pews and threw out suggestions—a venue for local performing arts, a restaurant, a yoga studio. Each idea came with disqualifying complications. After months of searching for the right plan, Conaway and Ross began to reconsider. Perhaps the old church was meant to be their next home after all. As they warmed to the notion, they consulted with local builders and architects who fanned their growing enthusiasm with good ideas. 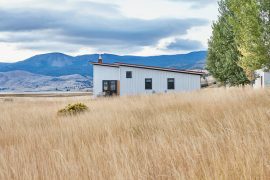 At the urging of a builder friend, they decided to be their own general contractor, a money-saving decision that can backfire on well-intentioned but unprepared homeowners. Fortunately, the couple had the ideal sensibilities for the big task ahead. The interior of the church, before renovation. Another factor in their favor was time. A first big step on the adventure was to stabilize the structure. Bulging exterior walls indicated time and gravity were taking their toll, so they poured a new concrete perimeter foundation just inside the old brick foundation, and steel reinforcement beams were bolted to the top of the bearing walls. One-inch-thick steel tie rods now span the interior from beam to beam to hold the walls in place. Although the church offered more than 1,300 square feet of interior living space, the couple didn’t favor cutting it up into a warren of traditional bedrooms and baths. They wanted to preserve the sanctity of the soaring interior, especially the evocative presence of the magnificent arched windows. The solution was a small 16-by-16-foot addition at the rear of the church that would include a master bedroom, laundry room and master bath. 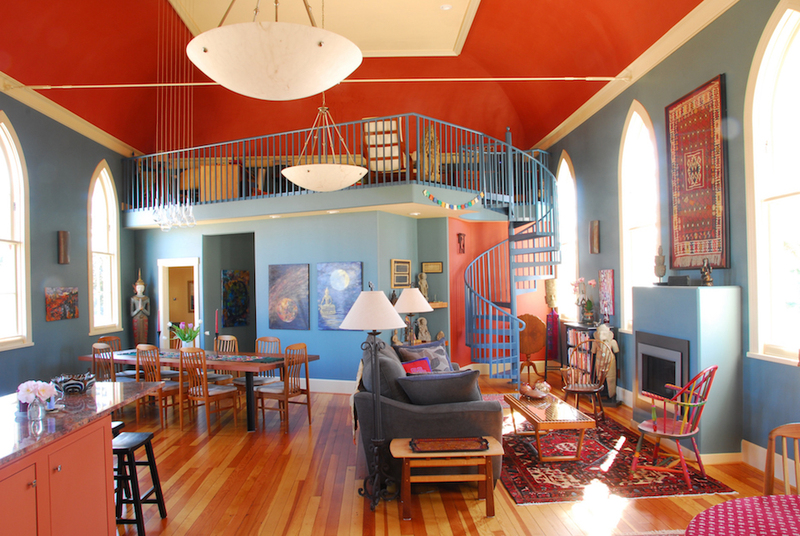 A cleverly conceived angled partition wall at the back of the church provided an offset, private passageway into the master suite, plus allowed a small half bath and a loft space accessible by a spiral staircase. 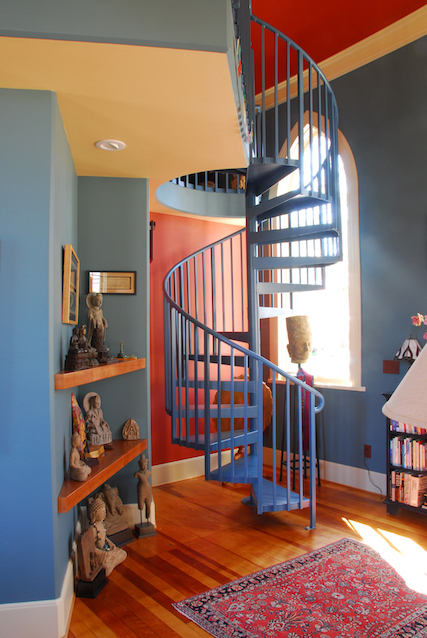 With their compact footprint, the stairs could be neatly tucked into a nook created by the angled walls. As with any alterations to a property on the National Historic Register, the new addition had to be in keeping with the historic intent of the original structure. To ensure authenticity, old interior wainscoting was torn out and re-installed on the outside of the addition to faithfully replicate a band of wainscoting on the church’s exterior. Brick from an old chimney was used to veneer the new foundation and match the original brick foundation walls. Inside, they removed worn purple carpeting to reveal beautiful fir flooring, which they subsequently repaired and refinished. Although they opened the old lathe-and-plaster wall for new wiring, plumbing and insulation, the couple managed to save the soaring lathe-and-plaster cathedral ceiling. Two layers of fiberglass batt insulation over the ceiling ensured excellent thermal performance. Tear out included removing an old choir loft at the front of the church that blocked several windows. 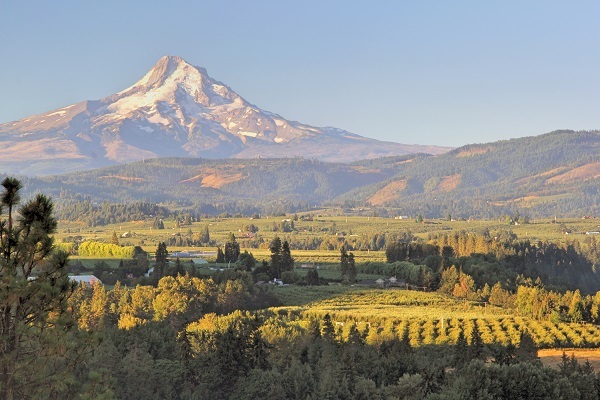 As work progressed, Conaway took on the pièce de résistance —the towering steeple—as his personal adventure. The first job was to remove the louvered panels that for decades had covered up the bell opening. As it turned out, those slats provided just enough space for bats to squeeze through. There were bats in the belfry and guano everywhere. “We took out about twenty-five bags of the stuff,” Conaway said. 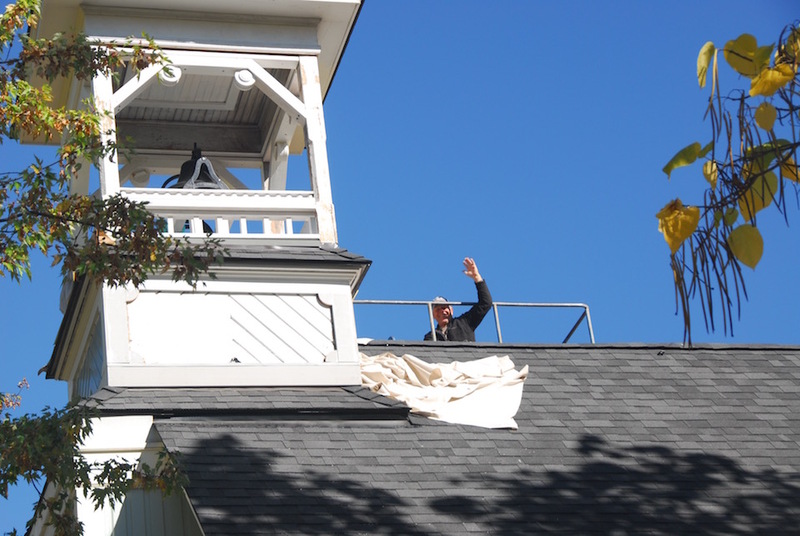 With determination and little fear of heights (he’s a former helicopter pilot), Conaway rebuilt and reconditioned the twenty-five-foot-tall steeple. Although original historical photos of the church didn’t reveal much about the bell tower, Conaway huddled with local historians to determine a period-appropriate design. The original bell had been removed years before, so Conaway found an old church bell on eBay. 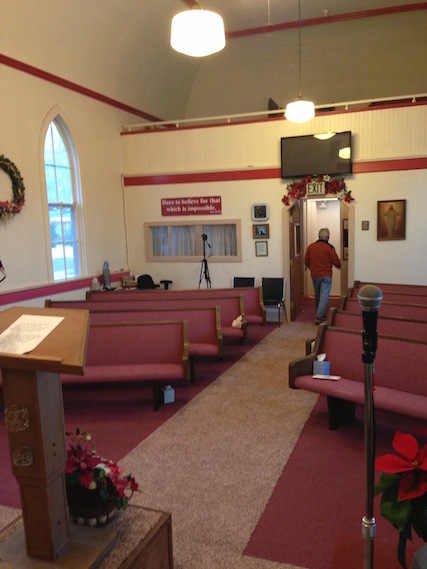 He rigged up a new pull cord from the bell to the church entryway. They ring the bell on special occasions. 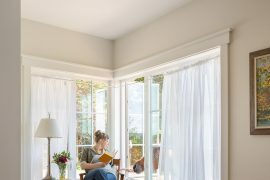 As the two-year renovation progressed, a big challenge remained: how to effectively tame the interior volume, so that the enormous room would feel like a home. That adventure fell to Ross. A long, open galley kitchen was a natural choice to fit the shape of the church and to provide enough elbow room for their two-cook household. Rather than try to fill up space, Ross kept the kitchen minimal. A sixteen-foot-long island, topped by an expressive piece of granite, is the centerpiece. There are no upper cabinets except for a small corner configuration that holds ovens and a microwave. 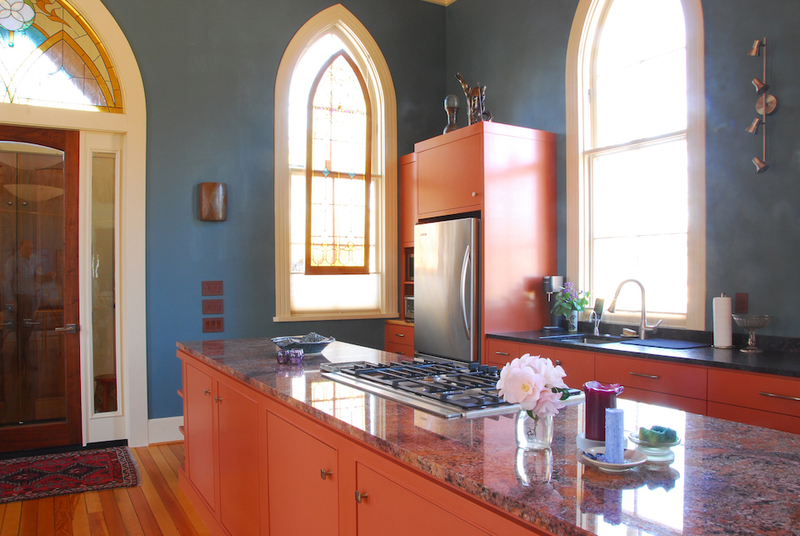 While Ross’s career as a management consultant helped keep the renovation on track, it would be her art studies at the City College of San Francisco that helped inform her color choices for the church interiors. In the end, she chose bold, organic colors that gave dimension and depth to the big vaulted room, but also worked to contain it and make it cozy. 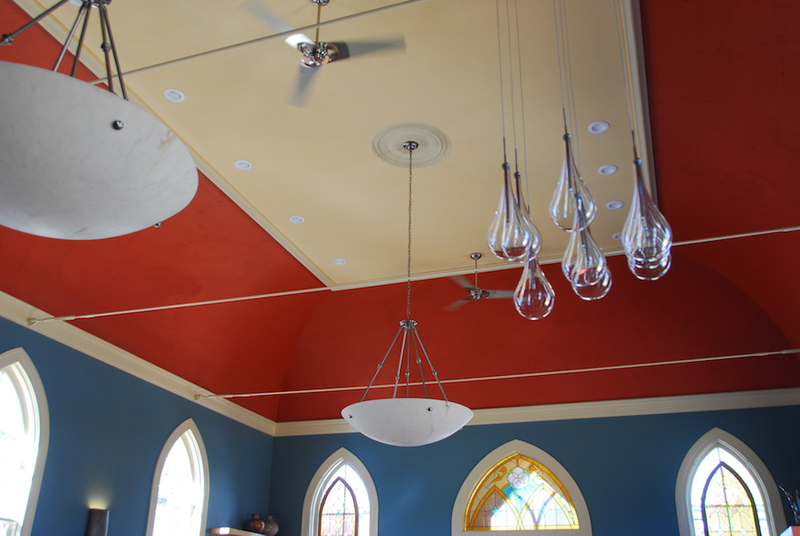 The ceiling got what Cory calls “a rust, earthy, chili pepper warmth,” and the walls took on a “sea-foam blue, like the ocean in the distance.” A custom-mixed trim color provided just the right counterpoint for windows, doorways, and Conaway’s crown molding detail. They also painted the exterior—a subtle robin’s egg blue highlighted with off-white trim and dark red accents at the windows. With a nod to “modern” common-sense building practices, the gutter-less roof was fitted with wide gutters to help keep water from dripping onto walls and around the foundation. With the renovation complete, the church has become a point of civic pride. Neighbors stroll past to admire it, and tourists stop their cars to snap photos. Inside, the couple’s eclectic mix of comfortable furnishings, antiques and items gathered on various world travels are an ideal complement to the main room. A small gas fireplace in front of an overstuffed couch is the perfect place for the couple to enjoy their labors and each other. 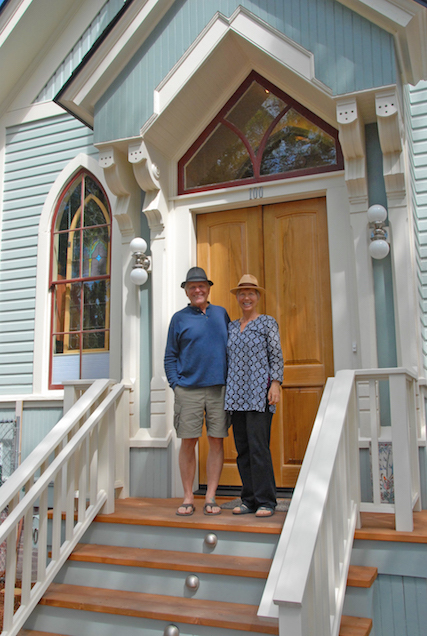 Although Conaway and Ross have vowed never to take on a major renovation again, they got exactly what they were after from their shared adventure. 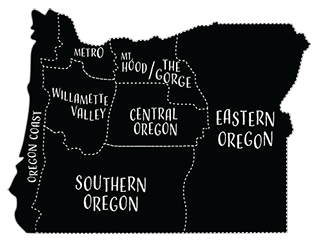 “It’s truly our home, and we love it,” Ross said.